Baby Spa sent me the wipes to sample. However all opinions are 100% my own. Before having my daughter I have to admit that I was not so Earth conscious. Now that she is here I want her, my future grand kids and great-grand kids to live in a nice green Earth. I have since taken the steps to make my home more earth friendly by watching the things that come into my home. I try to buy green products whenever possible and do a lot of diy stuff like household cleaners to reduce chemicals and garbage from packaging. 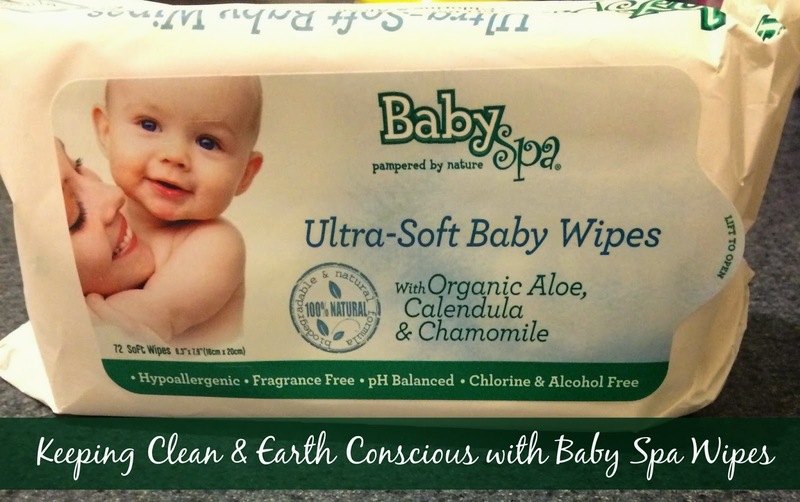 I was super excited to get to try the Baby Spa Organic Ultra-Soft Baby Wipes. Not only are they organic and 100% natural but they are also made of 100% biodegradable fabric. I wanted to see how these little wipes held up to a messy project. I got a little painting kit for my daughter and let her paint for the first time. The Baby Spa Wipes cleaned everything up really well and I didn't feel guilty about adding dirty wipes to the garbage. Baby Spa's products are "Hypoallergenic/Dermatologist Tested, 98-100% natural and 100% free of Parabens, PEGs, SLS/SLES, Phthalates, BPA and mineral oil". They also have products in Stage 1 for newborns to crawlers and Stage 2 for walkers to preschoolers. My daughter is 5 but we still use wipes for quick clean ups. I like that these are hypoallergenic, will have to give them a try. Every change we can make will hepl Mother Earth so much! Baby wipes are like a little gift to the world for everything! I was the same way before my daughter was born ... not so earth or health concious, then BOOM ... my life changed! (For the better) I can only use non-scented or anything of that sort on my daughter cause she is very sensitive. I'll give these a shot! Thanks! Baby wipes are so convenient when you're on the go with baby. They help to keep the smell down too. Love baby wipes for quick clean ups! Little ones can be SO messy! I have a stock pile of wipes in our house. We use them for EVERYTHING. most importantly - cleanups during crafts. I'll have to check out this brand! Baby wipes are so versatile. I keep a few extra packs in my house for times when I need to clean. Great clean-up job on the paint. We use baby wipes for almost everything. They are wonderful against paint. Our kids are surrounded by enough toxins as it is-this is great to keep around and in the car! Simply amazing the things we can do to help reduce our foot print and prevent unwanted and or needed chemical in homes and around our families. I'll be picking these wipes up next time I stock up. We use them in our home, car and travel bags. I'm gonna try this one..
Wipes are really great aren't they? I use them for everything. Kinda makes you wonder what's really in them, right? I definitely like that these are not only organic but are biodegradable as well. I have no kids-but I use them on occasion as does my Mom--going to look into this brand. It's really shocking waht is in regular wipes (Even BABY wipes) - the list of ingredients is so long on some. It just doesn't seem like we need 35 ingredients in a baby wipe. I love that baby spa agrees that fewer ingredients is better & natural ingredients are better. Cool! I haven't heard about these before but I might have to check them out. Wow! These sound awesome and look like they worked really well. We can't use regular baby wipes with our daughter, which doesn't really hurt my feelings since we are a "green living" oriented family too. These look like they would come in handy for face and hand messes, though! Awesome! I've bought some organic cloths that didn't do a good job at all. Thanks for the review! I’m loving that these clothes have organic aloe. So soothing, and good for baby’s tush as well as other parts. Truthfully, the wipes get used for baby and all other sorts of humans, so that makes them a plus when they are earth safe too. This sound great! I use wipes for everything! I was just like you! I wasn't green or environmentally conscious at all until my son was born. I would definitely look for this! Thanks for sharing!